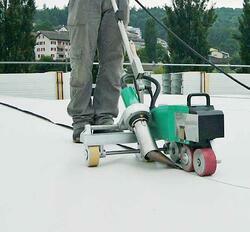 There are 3 main types of flat-roofing systems: built-up roof (BUR), modified bitumen and single-ply. Each system is designed to waterproof the roof and protect it from sun, rain, snow and more. This prevent leaks, mold and rot—all of which can weaken the roofing structure and cause costly damage. To help you evaluate your options, we’ve detailed all 3 roofing systems below. Around for more than a century, BURs were the most common flat-roofing system until the advent of single ply. BURs use multiple layers of tar and gravel to create a watertight seal over the roof, which protect bottom layers from damage. Tried-and-true—Roofers have been successfully using this method for more than 100 years. Thick coverage—BURs contain numerous plies that offer protection if outer layers are damaged. You’re not placing all your eggs in one basket. Highly resistant—The gravel surface is durable against everyday wear and tear, reducing maintenance requirements. However, FacilitiesNet also calls out concerns, mainly regarding BUR resilience in wide-open expanses and cold weather. Note: Traditional BURs are not flexible at low temperatures; however, modified bitumen solutions are and should be considered if you live in a colder climate. Introduced to the U.S. in the mid 1970s, modified bitumen membranes are roofing sheets made of asphalt that has been modified with either rubber (SBS) or plastic (APP) that offer greater stretch and flexibility. Uniformity—Modified bitumen sheets are manufactured under tight quality control, resulting in consistent thickness. Broader temperature range—The modified material can handle high and low temperature extremes better than BUR. A viable alternative is a hot-air welding machine, like the BITUMAT B2, which uses hot air to weld seams. This type of welding is quick, clean and effective compared to open-flame methods. With a single-ply roof, sheets of plastic membrane (for example, TPO or PVC) are rolled out over the roof’s surface and then welded together using hot-air tools. It creates a permanent, watertight covering that protects the roof from leaks. Consistent product quality—Manufactured in a factory, single-ply roofing materials are designed to meet strict quality controls, unlike those used in BURs. Easy installation, often faster and cleaner than putting in BURs. Energy efficient due to its light color and reflectivity, which can lead to potential HVAC savings and a more environmentally friendly solution. Lightweight materials work well on modern building designs that require material flexibility. The biggest drawback to single-ply roofs is that they only have one layer, whereas BURs and modified bitumen roofs have multiple layers. Therefore, if the single-ply membrane punctures or tears, the entire underlying structure is at risk. Each roofing system type requires its own specific set of roofing tools and equipment. Work closely with an authorized roofing distributor to identify and purchase the tools necessary to ensure a proper flat-roof installation. To discuss your unique roofing and equipment needs, contact a Hy-Tech Products specialist at 800.635.0384 or info@hy-techroof.com.